Her long and undistinguished career (her words, not mine) has included a three-year stint as the English version of a Belgian aerospace magazine, an interesting interlude as an editor in a very large law firm, and several hectic years in real estate marketing at the height of the property boom. She says that this tendency to switch directions every few years did nothing for her resume. What it did was give her ample opportunity to sharpen her writing skills and develop an entrepreneurial spirit. Q: Jane, have you always felt driven to write fiction or was there a particular trigger? A: I honestly never thought of myself as a writer (or creative person generally) until my late forties. Odd, really, because my ability to string a sentence together had been the driving force in just about every job I had—I always ended up in a role that used my writing skills. Every organisation I volunteered with tapped into them. But I suppose I’d been brought up to see writing as impractical, beyond its use for business letters and the like. I’d been a bookworm since the age of four and loved to learn and study, so I supplemented the boredom of business life with the acquisition of diplomas and degrees and thought I might one day aim for an academic career. The only problem with that was that I didn’t like teaching. Looking back, I realise that it was the writing element of those degrees and such that attracted me. In 2008, my varied career changed yet again when I was recruited into a fundraising post in a university—because the Vice President who recruited me knew I’d be able to write good appeals. Shortly after that, I started blogging (I killed that blog a while ago) for no reason that I could explain. 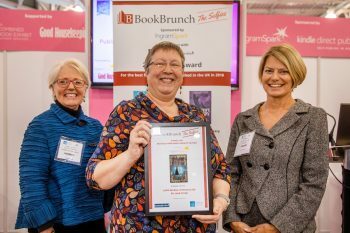 It was my first experience of getting my writing out in front of the general public and, with several years of corporate writing behind me, I had grown a sufficiently thick skin to enjoy the hurly-burly of reader opinions. Reading other blogs somehow led me to publishing blogs, and I began to read a great deal about publishing, both traditional and indie. And then in 2009, my fundraising job and I suddenly parted company after a particularly vicious bit of office politics. I found myself at home, in a state of shock. 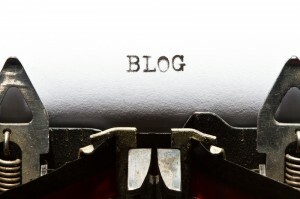 Two things happened: first, I finally saw sense and decided to become a freelance writer. Second, I had a massive burst of creativity that culminated in writing my first (still unpublished) novel. Then I wrote another. Good contacts from my fundraising job led to some lucrative freelance work that provided the seed money for my fiction business. I decided to self-publish in 2011 and never looked back. The intrusion of attractive, mysterious French physician Armand Fortier, with his meddling theory of murder, into Helena’s first weeks of mourning is bad enough. But with her initial ineffective efforts at investigation and her attempts to revive her long-abandoned interest in herbalism comes the realisation that she may have been mistaken about her own family’s past. Q: Quite a convoluted route, but coming from a business background myself, that resonates were strongly with me. If you were trying to describe your writing to someone who hasn’t read anything by you before, what would you say? A: I write a blend of mystery and saga set in the late Victorian period. I have two series, one set in Illinois (because that’s where I was living when I started it) and the other set in Sussex (because that’s where I live now). I always tell my readers that I’m a storyteller and entertainer rather than an historian, so I lean toward the lighter side of historical fiction. Yet the things I’m interested in, particularly the restraints on women in that period and questions of class, disability, and prejudice, tend to creep into my stories. According to my readers, I use a lot of long words; but I would say that it’s my characters who use long words, being Victorians and not afraid of vocabulary. I try to pour on as much crazysauce (as one of my reviewers said) as I can—murder, suicide, secret babies, affairs, Fallen Women, all the Victorian clichés that delighted me as an avid reader of chunky Victorian novels in my teens and twenties. Q: Having written series number one, how did you make the decision to leave that behind and embark on a new series set in a different country? A: I needed a break from the House of Closed Doors series, and was about to write a standalone book when the countryside around me began to be inhabited, in my imagination, by a new set of characters. I had recently read the first in Deanna Raybourn’s Lady Julia Grey series, and I absolutely loved the concept of a large and troublesome family but had decided not to read the rest of the series as I wasn’t keen on the love interest and didn’t like the gypsy plotline. I’d also recently rewatched the whole of Downton Abbey. I was now living in an amazing location which has been fictionalised by quite a few writers, including famously by E.F. Benson in the Mapp and Lucia series, and I just couldn’t resist the challenge. So I started out with the Raybourn premise of an aristocratic widow in a family setting whose first investigation was into the death of her husband. When I realised that Lady Helena would end up investigating her own family—and especially when I realised what the backstory of the mysterious French physician was—I knew I had a great series to write. Readers have tended to agree with me. Q: In traditional puzzle mysteries, such as Agatha Christie’s, the detective’s role is to restore order to a community after a crime has disrupted the status quo. The detective must arrange clues to unveil the culprit, thus returning the world to an orderly state. These stories enthral readers, but they’re problematic because they rarely describe what we experience in life. This leaves the writer with a dilemma. Do you aim to satisfy the reader or reflect the real world? A: If you want the solution to the mystery neatly wrapped up and tied with a bow by the last page, don’t read my books. It drives me a little insane when the detective manages to work out absolutely everything that’s happened by a combination of clues that have amazingly dropped into her path or by the sheer force of her own brilliant intellect. I often leave a loose end or two flapping around, because my heroines can’t possibly know everything. I get the occasional shirty email about the loose ends but most readers seem happy to use their own imaginations, which is what I want them to do. A: Well, I had a quasi-Catholic upbringing, although I switched over to my mother’s protestant side in the end. Editor’s note: A brief interruption here to say that Jane shares a name with, but is not to be confused for, the current Archdeacon of Southwark. A: But no, I have no writing qualifications whatsoever except the qualification of having written. I’m not enthused by the proliferation of MFAs in general, although the eternal student in me would love to be in a classroom discussing Tolstoy right now. 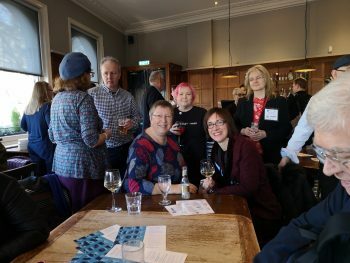 I feel that the pressure on younger writers to gain a qualification before they begin writing for publication has a tendency to produce writers with limited horizons, and writing should not have limits. And yet I can see how programmes and diplomas can be useful as part of a writer’s career. There’s a danger for genre writers of feeling that good enough is sufficient; because we’re not called upon to advance the art the way literary writers are, we can easily slip into complacency about our writing. That’s especially true of series writers—I’ve noticed that quite a few good series deteriorate in the quality of writing and plotting as they go along, especially if the series is left open-ended so that you can just keep on writing as many books as the fans will buy. That’s the sign of a writer who is no longer challenging herself. I’m planning to take a few courses myself in the next couple of years to get out of my comfort zone and sharpen up my ideas. Q: Doris Lessing says that moving from one country to another made her a writer. We already know that you lived in Illinois (and that you prefer American spelling). Is this something you can relate to? A: Possibly. I moved from the UK to Belgium just around my twenty-first birthday, moved to the USA as the mother of young children, and returned to the UK as an old bat. Each of the three countries I’ve lived in has a distinct literary and linguistic culture and a different way of thinking about the world, and for me the result has been that I’m far less likely than I once was to accept what the people around me are saying as “right”. It’s freed me to develop my own ideas of what is right and true, I suppose. Q: All writers are readers first and you’ve pleaded guilty to bookworm-ish tendencies. Can you give us an insight about your reading habits? Do you have a favourite armchair, perhaps? Big cup of tea? Glass of wine? A: We downsized into about half the living space when we moved from the States, and my office has far too much furniture shoehorned into it. My reading chair and footstool are constantly in my way but I would never get rid of them. I have everything I need: a window from which I can only see the sky when reading, a lamp clipped onto the bookshelf behind the chair, a table for my books and cup of tea or alcoholic drink depending on when I’m reading, and a radiator for winter. I’m a multiple-book reader so I generally have a print book by my chair, a book on my phone, a book on my Kindle (for bedtime) and an audiobook on my phone. If I keep going back to one particular book, I know it’s good (or I have a book club deadline). Q: Do you set yourself any reading challenges? A: I participate in the Goodreads reading challenge every year. My best year was 2012 with 101 books—how on earth did I manage to publish a novel? But I was experimenting with book blogging around that time, so I imagine I pushed myself a lot harder than usual. My biggest challenge now is actually sitting down with a book for dedicated reading time rather than just snatching a few pages when eating or before bed, or plugging in an audiobook when travelling or doing chores. I’m having to make a conscious decision to “do reading” rather than anything else, which is a sad reflection on how much time my author business takes up. Want to find out more about Jane and her writing? I recommend you visit Jane’s ‘About the Author’ page on her website, where there are still a few surprises in store. To get all of the inside gossip, you can also ‘become an insider’ (sign up to her newsletter). 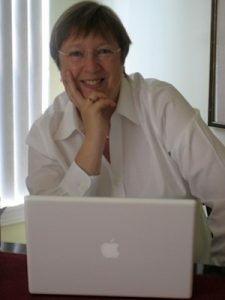 Visit her Books To Read page at https://books2read.com/ap/RWbr6x/Jane-Steen. 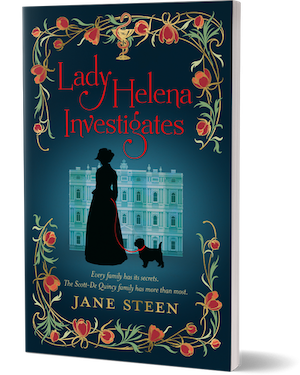 In celebration of her win, Jane has generously offered to give away one signed print copy and 10 ebook copies (delivery through BookFunnel) of Lady Helena Investigates. There are no geographical or other restrictions. Just be one of the first eleven to leave a comment. If there’s anything else you’d like to ask Jane, or to enter her giveaway, just leave a comment. Sounds like a great new series. History and mystery – two of my favourite topics. Congratulations on the award. Thanks Margarita! History and mystery are also my two favourites, who’d have guessed?